My new head torch has a mode that produces a red light. I've seen this several times and I have no idea when our why you would use it? Red light preserves your night vision. 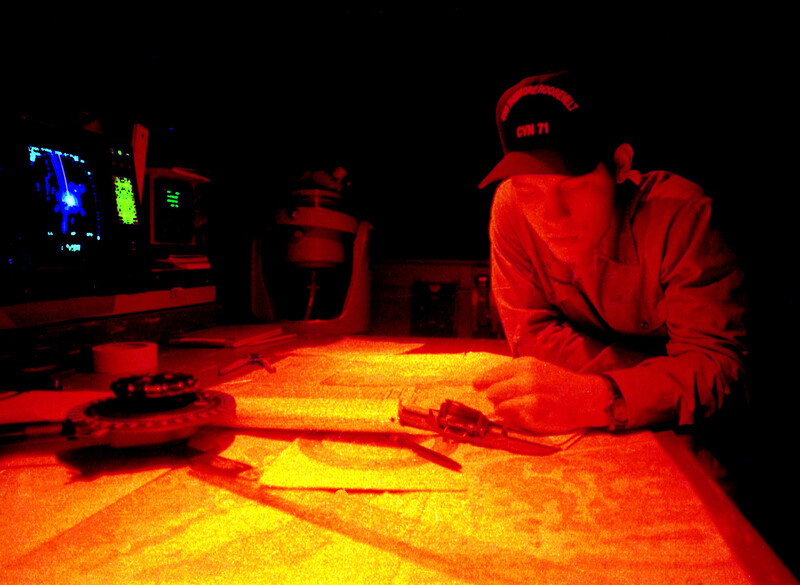 Red lights are used in photography dark rooms, military bunkers, submarines, and anywhere you might find yourself working in the dark. It gives you light to see by, while at the same time keeping your eyes adjusted for the dark. I use my red light mostly when I'm when I'm around a camp fire, in the middle of the night when I'm in my tent, or when I have to go out to do my business in the pitch black. It's also excellent to use when there's a bright moon. Using your red light in the tent is great because you won't blast your eyes out, or disturb anyone else in the tent, your eyes don't need to adjust to it like they need to adjust to white light. This is exactly why digital alarm clocks have red numbers. @Olin explains some of the science in his answer, and @radpin's comment to the OP links to this question on biology.SE. Using your red light outdoors in the dark gives you much more peripheral vision. When you're using your white light; your eyes adjust to the light so you can only see what's being illuminated by your headlamp. When your eyes are adjusted to the dark, you can use the red light to illuminate the trail, but you will also be able to see everything that's being illuminated by the moon in the distance. Try it out next time you're in the dark, give your eyes enough time to adjust to the dark, then turn on your red light. You'll be surprised how much you can actually see. The automatic f-stop mechanism (iris) in your eye is less sensitive to red light than the shorter wavelengths. Therefore, red light provides some illumination, but doesn't trigger your eye to stop down and make you temporarily blind when you shut the light off. There are also other ways your eyes adapt to ambient brightness that are also less sensitive to red. In contrast, if you were to read a map using a bright white light, your eyes would adjust to the brightness and you'd have trouble seeing for a little while after the light was shut off. Using red light instead of white decreases the eye's response to the brightness significantly. In addition to the answers already mentioned, I prefer red light while outdoors in the summer because it seems to attract fewer insects. I always seem to have more insects flying around my face if I use white, and fewer with red. Night vision and, if you're camping with a partner, a nice way to not blind them around camp. It is also a way to see in the dark without disturbing animals you're hunting, or the fish if you're night fishing. Is there a standard set of light signals for mountaineers? How to replace an unknown propane lantern globe?